How does Visa Calculate its Currency Exchange Rate? In my previous post, I explained exactly how Capital One calculates its currency exchange rate. As it turns out, Capital One simply uses the exchange rate that is posted on the Visa Corporate Exchange Rates webpage (Link Updated 11/2014). But what about Visa? How do they come up with the rate that all Visa branded credit cards use (before the bank foreign transaction fee), and how does that compare with other options for currency exchange? Every day—except weekends, Memorial Day, Christmas Day and New Year’s Day—Visa calculates the rate for the next day’s transactions. The Visa rate is selected from a range of rates available in wholesale currency markets or the government-mandated rate in effect one day prior to the applicable central processing date. Visa makes this rate available to issuing banks, which may adjust the rate when billing cardholders by applying a foreign transaction fee. The rate Visa makes available to issuing banks may vary from the rate Visa itself receives. Most consumers find that using Visa is a convenient and cost-effective way to make purchases and obtain cash when traveling internationally. How do Visa’s currency exchange rates compare with wholesale currency markets? If you noticed in the statement above, Visa remained pretty ambiguous about how they come up with each day’s exchange rate. They only state that “the Visa rate is selected from a range of rates available in the wholesale currency markets…” Needless to say, I’m curious to know how Visa’s rate compares to this “wholesale currency market. ” To answer this question, I looked up the currency conversion rate from a number of different sources and put them in the tables below. With the exception of Master Card and Visa, every source can be considered a player in the wholesale currency market. The rates listed in Yahoo!Finance, for example, are said to be “bank rates,” while OANDA says its rates reflect interbank rates for transactions of $1 million or more. 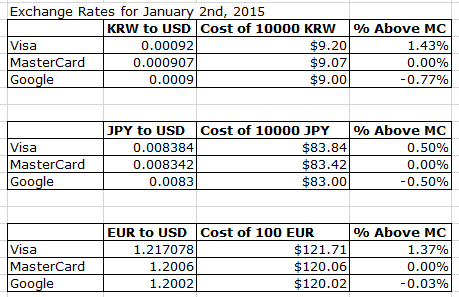 I looked up the currency conversion rates on three different dates, just to see if there were any discrepancies. 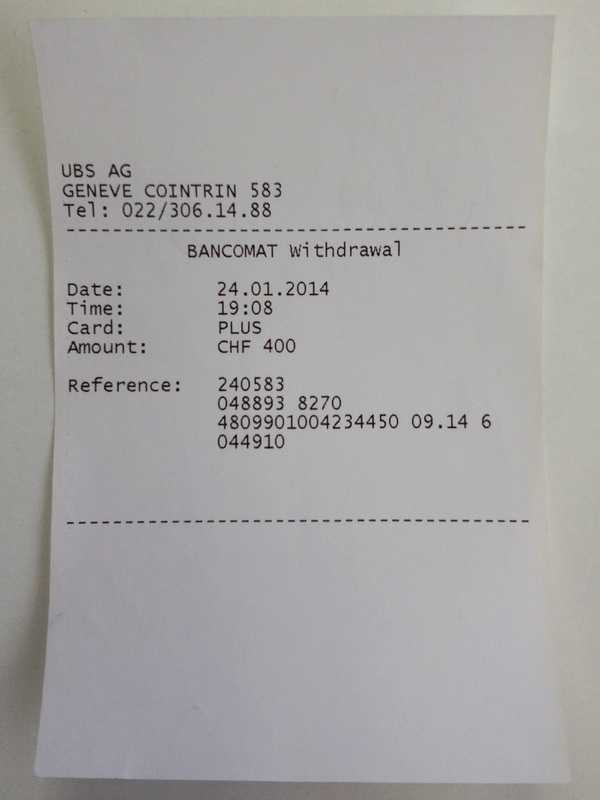 The tables contain the EUR to USD currency exchange rate for a transaction that was posted on the given date. Each date is sorted by highest cost (in USD) of 50 Euros. For more information on the sources, please see the bottom of the post. What are the takeaways from these charts? The rankings are different on any given day. 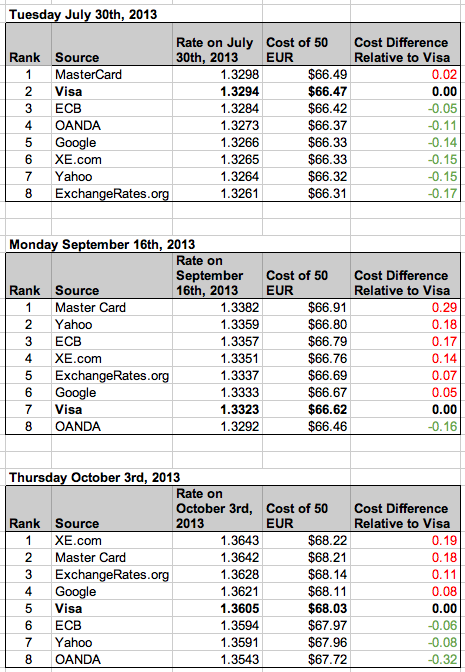 On July 30th, Visa had one of the worst exchange rates, but on September 16th it had one of the best. To me, this says that on average, Visa rates are a pretty good representation of wholesale markets. Obviously my sample size of only 3 days makes it impossible to draw any scientific conclusions, but just with this quick look I feel pretty comfortable taking Visa’s word. 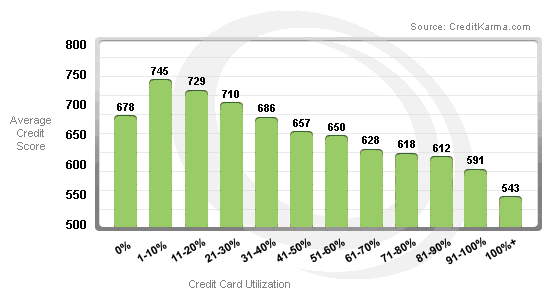 Master Card has consistently one of the worst rates for every day. In the 3 days I looked at, Master Card always had a higher rate than Visa, costing you anywhere from 2 to 29 cents more that Visa on a transaction of 50 Euros. The OANDA rate is always better than the Visa or Master Card rate. This, however, is not surprising since the OANDA rates are said to reflect interbank transfers over $1 million dollars. Conclusion: While I may not get the same rate as I would when I was transferring millions of dollars, it is pretty clear (again only 3 sample dates) that Visa’s rates are competitive with the wholesale currency markets. Kudos to Visa for actually telling the truth on their FAQ website! Visa: This is the rate used for all EUR to USD transactions, the details are described above. European Central Bank (ECB): In order to find the historical rates, you have to navigate to this page which shows the ECB reference exchange rate at 2:15pm CET. The ECB does not provide rates for Saturdays or Sundays. OANDA: According to this page, “The prices quoted by the currency converter are based on interbank market rates and generally reflect the exchange rates for transactions of US $1 MILLION or more.” The rate from this website is the Daily BID rate (as opposed to Ask or midpoint) because “it more accurately mimics the rate that you would be charged if you were exchanging money.” Daily is defined as the 24-hour period ending 22:00 UTC on the day prior to posting. Sunday rates are identical to Monday rates at OANDA. Google Finance: The daily rates from Google say they are taken at 23:00. It does not indicate which time zone. Google does not provide rates for Saturdays or Sundays. Yahoo! Finance: The only note on Yahoo’s webpage says that “The exchange rates given are ‘bank rates’. High street rates may be subject to commission.” Yahoo! does not provide rates for Saturdays or Sundays. If you select a Sunday, say October 6th, it will show you the rate for Friday October 4th. XE.com: The rate given by this site is the Mid-market rate as of 16:00 UTC on the specified date. ExchangeRates.Org: This rate is the average rate for the specified date. Here, Friday and Saturday rates are always the same but Sunday rates are different. Discover Credit Cards: Unlike, Visa or MasterCard, there is no separate currency conversion webpage for Discover. This was the only information I could find. American Express Credit Cards: Perhaps it’s because American Express does a lot of currency conversion (traveler’s checks, kiosks etc.) but I couldn’t find a satisfactory link that listed their currency conversion rates. The only link I found was a link titled “American Express – Currency Converter.” The link turns out to be basically the same information as the OANDA link above (in fact the site says “powered by OANDA”), except it is just presented in a different format. How does Capital One Calculate its Credit Card Currency Exchange Rate? Typically, when you use an american credit card to buy a product in a different currency, the credit card company will charge you a 2-3% fee right away – called the foreign transaction fee – before it converts the currency according to the latest exchange rate. If you travel a lot, the foreign transaction fees can add up very quickly. Fortunately, there are a number of credit cards, including all Capital One cards, that charge NO foreign transaction fees. For a list of these cards, use this post from Nerd Wallet . If you are reading my post, however, I’ll assume you already know about the no transaction fee credit cards, and are interested in some more in depth questions like: How does the credit card company determine their currency exchange rate, and can the credit card company use the exchange rate to charge hidden fees? The best way to answer these questions is to use an actual credit card transaction with my Capital One Visa card as an example. I will provide copies of my receipt and credit card statement of one transaction in Part 1. In Part 2, I’ll answer questions about the currency exchange. I am a proud owner of a Capital One Visa card precisley because of its no foreign transaction fee. I have taken the liberty of posting photos of 1. my actual paper receipt, 2. a screenshot of my credit card Statement, and 3. a screenshot of my transaction list from Capital One’s website. All of these documents contain information about a customs tax transaction that I made in Hannover, Germany on February 1st, 2013. 1. 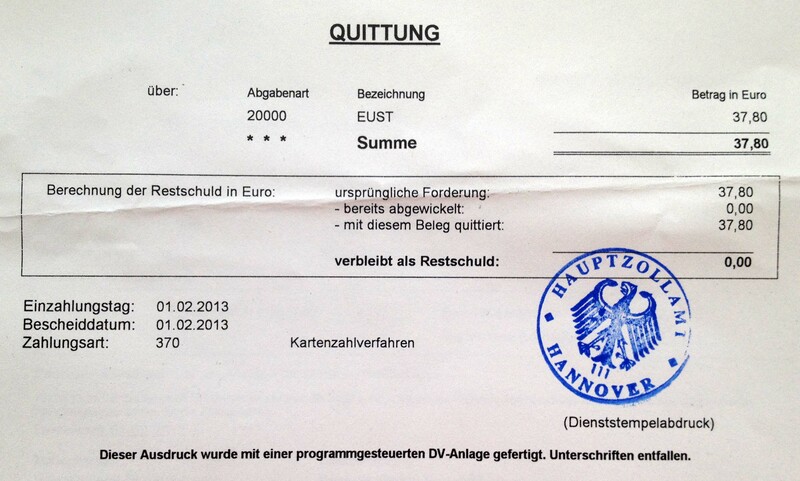 Actual paper receipt: Below is a photo copy of my receipt (Quittung) from the Customs Office (Hauptzollamt) in Hannover, Germany. The important information here is the Total (Summe) I paid, which was 37.80 Euros, and the date (Einzahlungstag), which was 01.02.2013. Please note that the date on this receipt is in DD.MM.YYYY format, which is typical in Germany. 2. Screenshot from my Captial One Credit Card Statement: When I paid 37.80 Euro for the custom tax, I used my Capital One credit card where I have an account in the United States. Since my account is in US Dollars, the transaction had to be converted from EUR to USD before it showed up on my statement. Below is a screenshot of a small part of my February Credit Card Statement (my account number is blacked out) where it lists the transaction “Nebenzollzahlstelle HannoHannover” and the exchange rate used. You can see that my 37.80 Euro transaction became a 51.84 US dollar transaction once the exchange rate was applied. 3. Screenshot from my transactions list on Capital One’s website: Below is a screenshot of my transactions list that you can find by logging into your Capital One online account. The transactions listed here are exactly the same as the transactions that show up in your monthly credit card statement, with one notable difference. In the online transaction viewer, you can click the “+” button next to the transaction date and it will show you both the Transaction date, and the Posting date. In my example, it shows that while the transaction actually occurred on February 1st, the transaction did not post until February 2nd. This is an important distinction because Capital One (and most credit card companies) calculate the exchange rate based on the date of the posted transaction. How does Capital One determine its currency exchange rate? The answer is pretty simple actually. Capital One uses the exact exchange rate that is posted on the Visa Corporate Exchange Rates webpage (Link updated 11/2014). This is based on my conversations with Capital One customer service, other credit card message boards like here, and – most importantly – checking the data for myself. Below are two screen shots of Visa’s webpage (the input screen on top and the output screen on the bottom) that show Visa’s exchange rate for February 2nd, 2013. You should take note two things. First, is that I set the the bank foreign transaction fee to 0%. Second, is that Visa’s exchange rate is the inverse exchange rate of what was provided on my credit card statement. The exchange rate on my credit card statement was in USD to EUR, whereas the Visa exchange rate is given in EUR to USD. 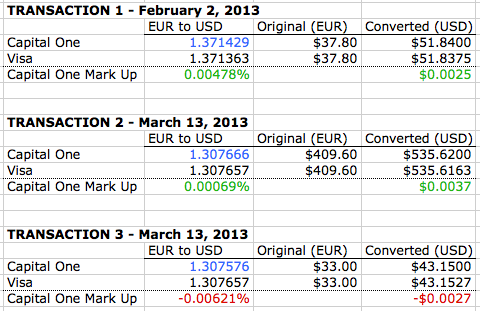 In order to compare apples to apples, I converted Capital One’s exchange rate to a EUR to USD rate. This is done simply by taking the inverse: 1 / 0.72916667 = 1.371429. In the end, the exchange rates do not match exactly – Capital One has an exchange rate that is .005% (five thousandths of one percent) higher. The difference, however, is negligible, since both exchange rates result in a final cost of $51.84 after rounding. Does Capital One hide extra fees in its exchange rate? No, not that I can tell. A lot of people are skeptical when they hear Capital One say “No Foreign Transaction Fees!” They think that maybe Capital One makes up for the 0% transaction fee by having a higher currency exchange rate than other cards that are Visa sponsored. In fact, you might look at the extra .005% that is added in my example above and say “Aha! thats how they get you!” But that would that be really silly for Capital One, who makes entire advertising campaigns on “No Fees.” If they were going to try and recoup the money they lost by having a 0% foreign transaction fee, wouldn’t they increase your exchange rate by a lot more that .005%? After all, other banks charge up to 3% foreign transaction fees. After reviewing a few of my other credit card transactions, I found that the difference between Visa’s exchange rate and Capital One’s exchange rate varied for every transaction. Capital One does not up-charge .005% for every transaction, in fact, sometimes the Capital One exchange rate is lower than Visa’s. I’ve compared three of my transactions below, two of which were posted on the same date. Interestingly, Capital One listed two different exchange rates for the two transactions that were posted on the same day. I won’t post screenshots of my statements and receipts like the first example for the sake of brevity – you’ll just have to take my word for it. Why the variation in Capital One Exchange Rates? The difference in exchange rates appears to be the result of Capital One trying to avoid having to deal with tenths or hundreths of a cent. Allow me to explain. 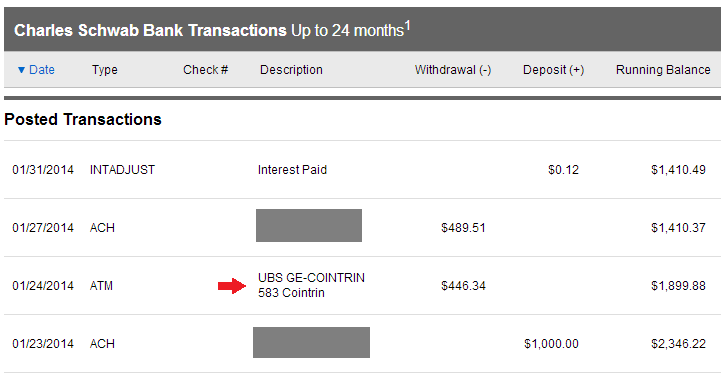 In transaction 2, when you multiply 409.60 Euros by 1.307666 (Capital One’s inverse exchange rate), you get $535.6199997. When rounding up at a precision of 6 decimal places, you end up with $535.620000 exactly. As shown in the screenshot below, all of Capital One’s currency exchanges result in perfectly whole numbers (no fractional cents) when you round and use a precision of 6 decimal places. I assume that this means that Capital One uses 6 decimal points for all of their banking transactions. If they used Visa’s exact exchange rate instead and rounded with a precision of 6 decimal places, they would have charged me $535.616307. Since I am only going to pay Capital One exactly $535.62, they would in effect be losing $0.003693 ($535.620000 – $535.616307) for that transaction. When you think about the millions of transactions that they process every year, that small amount could end up being pretty big – just ask the characters in the movie Office Space. For me, as the credit card holder, the slight difference from Visa’s currency exchange rate doesn’t matter because I always end up paying the correct amount and don’t have to worry about fractional cents. In the end, the important thing to know is that Capital One really does just use the exact exchange rate posted by Visa. This is also supported by the nerd wallet study, which shows that while foreign transaction fees can vary among credit card companies, the exchange rates don’t. Now that you know exactly how Capital One does it, you are probably curious how Visa comes up with their rates and how they compare with other methods of currency exchange. These questions are tackled in the next post How does Visa Calculate its Currency Exchange Rate?